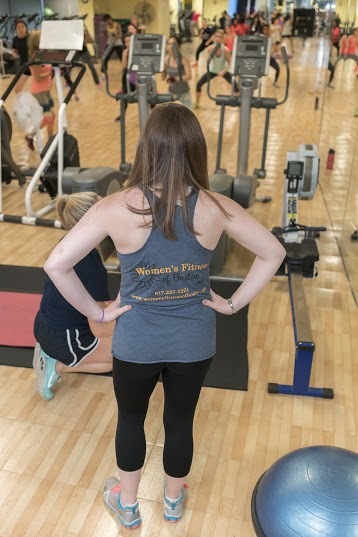 Women’s Fitness of Boston, WFOB is an all women’s fitness full service fitness club committed to helping women learn healthy habits to last a lifetime. 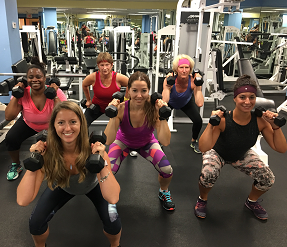 We offer a comfortable environment, welcoming and knowledgeable staff to help you get healthy and fit. WFOB offers modern strength training equipment and vast array of cardio machines, dumbells, stability balls and more. We provide various classes to fit your schedule at unbeatable prices! With our 30 day trial, clients receive weekly emails with healthy lifestyle tips to begin their journey to wellness. We recommend clients select tips from three major categories: Mind, Body & Soul. Recommendations range from keeping a gratitude journal, trying a group fitness class at the club, to putting down devices and taking a nature walk. We are a supportive community with both caring members and a passionate team staff including 5 onsite personal trainers. If the walls could speak, they would share success stories of members overcoming issues of self-confidence, loss of loved ones, divorce, personal achievements, goals accomplished, marathons completed, fitness competition ribbons, Instagram model success stories, body image improvements, weight loss journeys, and more. We believe fitness is an overall journey of mindfulness and is created by balance. Our goal is to help women implement healthy habits for a lifetime both mentally and physically! WFOB is a full service fitness club, with high quality, educated personal trainer/coaches and group fitness instructors helping clients get results! We help you create healthy lifestyle habits to last a lifetime. Be the best version of you! Learn to live healthy, be fit, be strong, and join our community of fit and healthy minded women today! Beginning with a complete assessment (exercise history, nutrition, body composition and physical endurance) our fitness professionals learn what changes need to be made to attain your personal goals. Once your program is designed we teach you how to use the equipment properly and safely. From split-body strengthening routines to 30 minute circuits, we’ll customize a program that fits your lifestyle and needs. What’s your excuse? Call or send us an email today ! Give us a call or stop by to see what we can do for you. We know you’ll be impressed with our approach and our facility. We are here to help you meet your fitness goals! Call us today to schedule a free workout! WFOB is the best women’s gym around. The gym is clean, well equipped, and has a fantastic staff. Personally, I train with Lecticia. She is wonderful and becomes your own personal cheerleader. She is extremely motivational to say the least. I cannot say enough positive things about this gym. It is truly a wonderful place to belong too!